Sea urchins belong to the group of animals called echinoderms which means "spiny skin". A sea urchin's shell, or "test" is round and spiny ranging in size from 3 to 10 cm across. Their color varies from black, dull green, brown, blue, and red. Sea urchins have tiny tube feet found on their spines. The feet act as suction cups that help the sea urchin move about slowly, capture food, and hold onto hard bottom. The sea urchin's mouth is found in the middle of the underside of its body. The mouth has five tooth-like plates for feeding. Sea urchins are omnivores, meaning they eat both plants and animals, however they feed mostly on algae, along with decomposing matter. Their spines are used for protection and trapping food. Prey: Sea urchins are prey to many predators in their marine environment. Some of their main predators include crabs, large fish, sea otters, and birds. Sea urchins reproduce during the spring. Sea urchin eggs do not hatch for several months. 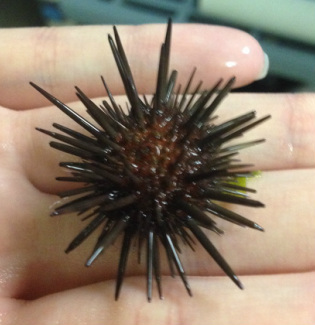 Juvenile sea urchins become large enough to settle down to the ocean floor between ages 2 and 5 years old. Characteristics: elongate oval test (shell), long and slender spines thickened at the base. Habitat: Commonly found in limestone reef rock in shallow marine environments. They use their spines and teeth to create shallow depressions or burrows in rock to hide in. Juvenile Echinometra lucunter are used in feeding assays at the Sotka Lab!